I woke him up at 2:43 p.m. yesterday. Kumusta? I asked. Like a giant awakened from his restful slumber, the voice of the only Cebuano among the one dozen Gilas Pilipinas players was sleepy. I apologized. “Okay ra,” June Mar said. How’s the celebration? June Mar explained that, in a few hours’ time, he and his fellow heroes will be feted with an awarding ceremony prior to Game 1 of the PBA Governors’ Cup. The boys deserve it. 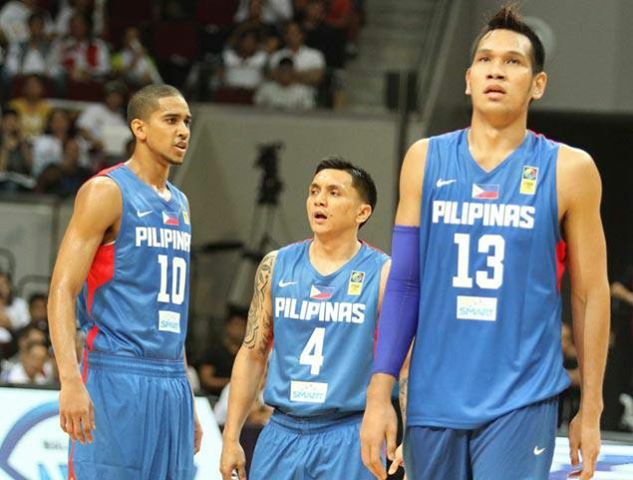 After non-stop, game-after-game, pressure-packed and almost-nightly encounters from August 1 to 11 during the FIBA Asia Championship, they deserve to be accorded the standing ovation. They deserve to relax, drink, grin and dance inside Resorts World. Mr. Fajardo, at 23, is the youngest player in the roster that includes several three-decades-old players: Jimmy Alapag, 35; Gary David, 34; Marcus Douthit, 32; Ranidel De Ocampo and Marc Pingris are 31; and Jeff Chan and Larry Fonacier are 30. What did he learn from the international-level experience? “Gamiton ang (Use the) height,” he said. We talked about the last game versus Iran and him guarding the 7-foot-2 behemoth, Hamed Haddadi, who towered by four inches over the 6’10” Fajardo. “Dako and bug-at (Big and heavy),” June Mar said of Haddadi. He didn’t find him solid — as in, muscular-solid — but heavy. It looks like, these band of Gilas teammates very quickly will disband and rejoin their different PBA squads and face each other — not as close buddies — but as opponents during the PBA Governors’ Cup. About the story that leaked in the press of Manny V. Pangilinan giving each Gilas member a cool P1,000,000, June Mar said that there was no official word on that yet. “Wala pa mi gi sulti-an,” he said, although he did hear about the rumors. As to what he’ll do with the extra P1 million if ever it gets deposited in his bank account, June Mar’s answer had me smiling. “I’ll buy a cow for my dad,” he replied. That’s a nice and appreciative gesture — coming from a son who has proud pride to the Fajardo family. His closest friends? Marc Pingris and Japeth Aguilar. You know why? “We’re all fond of online games!” June Mar confessed. Proud of his roots in Cebu, where he studied HRM for the University of Cebu and where he donned the blue-and-gold Webmasters uniform, he acknowledged the help of two individuals who helped mold him: Augusto “Gus” Go, the owner of UC, and the team’s mentor and manager, Baldomero “Merong” Estenzo. On a personal note, the few times that I met June Mar in person — plus our phone conversation yesterday — he comes across as a very shy, humble and respectful person. He’s Gilas but not hilas.